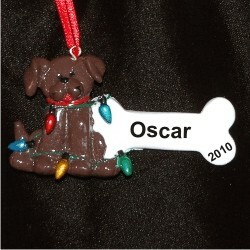 Surprise your chocolate lab or other brown-furred Fido with the brown dog personalized Christmas ornament featuring the pet's name and the year along with a bright string of lights. These are handcrafted resin dog ornaments personalized in a stylish font - the computer font is used in the photo for clarity. We include an attractive cord that offers easy display of these pet ornaments wherever they bring the most pleasure. The brown dog and bone Christmas ornament personalized for special pets is available from Russell Rhodes in other colors too, so we'll have a personalized holiday gift for all the dog lovers on your list. Each arrives in our custom velvet gift and storage bag. Christmas Ornament Dec 15, 2014 Mary R.